Divorce is never easy, and meeting with a divorce attorney for an initial consultation can be a difficult and an emotional experience. Before your first phone call or face-to-face consultation, it helps have questions prepared ahead of time, so you can make an informed choice about whether a particular lawyer is a good fit for you. The right answers to the right questions can let you know that you’ll be getting the service you want from an attorney who understands your situation. This should be one of the very first questions you ask of any prospective divorce lawyer. An experienced family law attorney will be able to work efficiently, address all your concerns, and be prepared to handled your case. Your time and money will be well spent. You should also ask how much of your attorney’s practice is devoted to family law. While most attorneys can represent clients in a wide variety of legal circumstances, someone who is focused more on family law is much more likely to be able to offer the best help. Are you the person who will be working on my case? Many law offices work in teams, which can speed up the process and even save you money—but some offices may bump work to new associates who don’t have the experience your legal situation requires. If there is another attorney that will be working on your case, ask if you can meet with him, too, so you can get a sense of his skills and experience. How do you feel about mediation and settlements? Your attorney is there to fight for your legal rights, but conflict resolution and other problem-solving techniques should be a key part of your attorney’s professional skill set. Your attorney should be willing to talk about mediation or arbitration during your divorce because litigation is often time-consuming and expensive. An overly-aggressive attorney who isn’t willing to help you negotiate during your divorce can make the situation more complicated than it needs to be. Being assertive isn’t a bad thing, but a lack of flexibility can eat up your time, cost you more money, and make your divorce more emotionally draining than it already is. What are your rates, and how will you charge me? Making sure that your attorney charges within an acceptable price range is important, and knowing exactly what you will be billed for will help you plan your divorce budget. Many divorce attorneys require an up-front payment, called a retainer, then charge you against the retainer per quarter (15 minutes) or tenth (6 minutes) of an hour. Some attorneys may also bill for each phone call, email, or letter that you exchange. Be aware that rates for court appearances may be different, so if there’s the potential for a lawsuit, you should be aware of any risk of a cost increase ahead of time. Don’t forget to ask about any additional costs that could be involved such as forensic accountants, private investigators, or other specialists that may be necessary to make your case. It’s important to know that your prospective attorney may not be able to provide you with a “grand total” estimate of the cost of your divorce, as it depends on the specific details of your legal situation. So, if an attorney quickly offers a dollar amount that seems too good to be true, it probably is. Are you comfortable representing my unique needs? Just as every person is unique, every divorce is different, too. If your case has unusual or extraordinary circumstances and your attorney isn’t equipped with the knowledge to handle your case, it’s better to be up front before either of you commit to a professional relationship. You’ll want to have some information of your own ready, so you can answer the attorney’s questions, including any prenuptial or postnuptial agreements, divorce summons, protective orders or other court orders, and police reports. 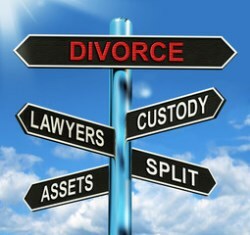 Be able to answer questions about the assets involved in the divorce and how you might want them to be divided. Overall, think a little bit about your goals in relation to the divorce. If you have children, spend time thinking about what your ideal custody arrangement would be. By being prepared ahead of time, your first consultation can leave you feeling confident that you’ve chosen the right attorney. 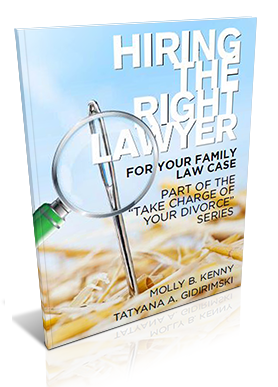 When you’re ready to get help with your divorce, the Law Offices of Molly B. Kenny is here for you and your family. Let us bring our decades of family law experience to the table for you, so you can begin moving forward with your new life. To arrange a private consultation in our Bellevue law office, please send an email using the contact link on this page, or call us by phone.